I missed the last Forum Research poll, conducted yesterday, as it was not reported by the Hill Times. 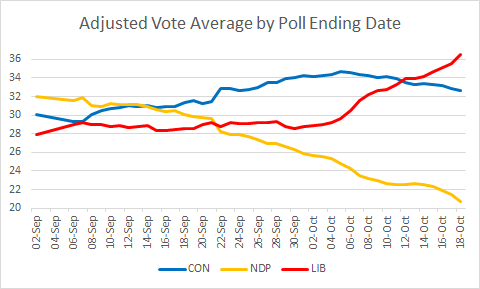 It has the Tories jumping by 4 points in Ontario, but losing the lead to the NDP by 2 points in BC. 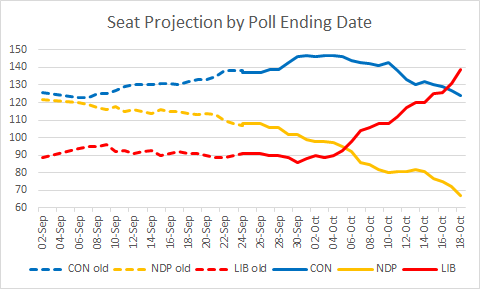 The final projection might have been different for Etobicoke Centre (that's the seat that I moved from Tories to Grits to balance risk in Ontario), Kamloops--Thompson--Cariboo (very narrowly projected Conservative over NDP), and perhaps Vancouver South (ditto over LPC). BTW, what time can we legally start discussing election results? A jump from three points isn't important from a statistical point of view since it is inside the margin of error. I'm surprised to see that NDP is almost relatively uniform in Quebec - same level both inside Montreal and outside the city. That's because both Bloc and Liberal as well as many ex-Cons voters have flocked to the NDP. The difference is that in urban areas NDP had a greater pool to draw from. That is why it will probably win more seats in urban areas in the end. Supports my prediction that the NDP will gain 5 seats in BC, 3 from the Conservatives and 2 from the Liberals. I'm intending to blank out the old results and fill in the new results when they start to be reported. I hope the target lists are useful. 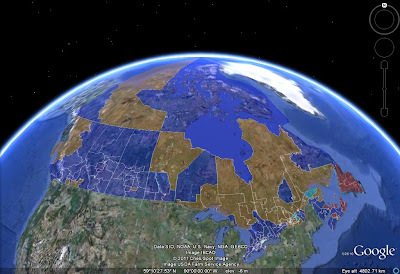 Districts of Different Sizes: Who Benefits? One Person = One Vote: What Is a Person?